The gardner. The home cook. The philanthropist. The entertainer. The conservationist. All of the above. 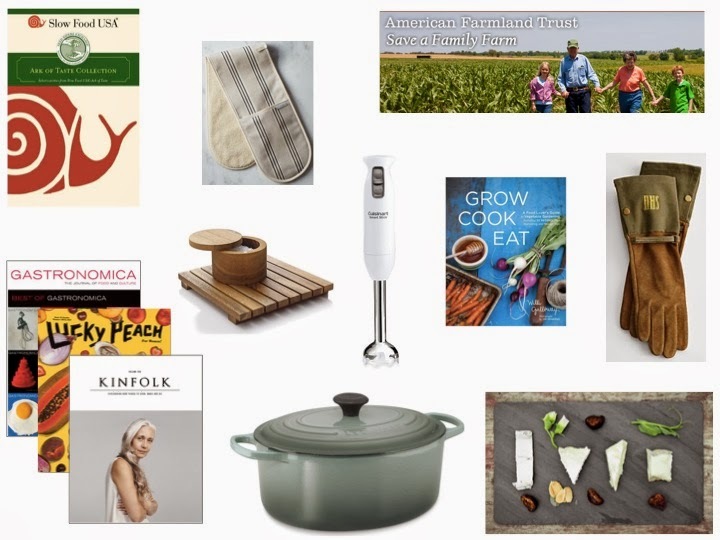 Below are a few gift giving ideas for the mindful food lover in your life. Unfortunately, this comes too late if you celebrate Hannukah, (apologies for that--I have been sick for weeks and am running behind on life in general) but if you see something you like, do make a mental note for that next birthday, anniversary, or "just because" moment. These gifts are wonderful the whole year round. Happy shopping! 1. Slow Food USA Ark of Taste Seed Collection: a yummy assortment of seeds from Ark of Taste's catalog of endangered foods. Have your Tennis Ball lettuce, and eat it, too! 2. Double Oven Mitts: From the lovely Provisions store at Food52.com. Such a luxury not to spend 10 minutes tracking down your second oven mitt every time you use the oven. 3. Donate to Save Family Farms: The older I get, the more important it seems to give back for the holidays. Donate in your loved one's name to American Farmland Trust to save farmland and support farmers. Act quickly and your donation will be matched by one AFT's founders! 4. Acacia Salt Cellar: So much easier to season properly when you can just grab whatever sized pinch you need. Bonus: you don't have to worry about your salt caking up in humid weather. 5. Cuisinart Hand Blender: This is one gadget that gets used in my kitchen all. the. time. Soups, smoothies, baby food--infinitely easier than transferring things to a blender. One of my absolute favorites. 6. Grow, Cook, Eat: A great book for the beginning home gardner. Covers all the basics without overwhelming, including lots of yummy recipes. A great way to get inspired over the winter. 7. Personalized Gardening Gloves: Love these more for their stylish simplicity than anything else. Sometimes it's nice to feel the warm soil on your bare skin, but these are great for the days when you can't spend half an hour scrubbing dirt out of your fingernails. 8. Magazines, magazines, magazines: For the food lover in your life, the gift that keeps on giving. There's a food mag for every kind of foodie these days, from quirky, to artsy, to academic. 9. Le Creuset Oval Dutch Oven: Another item that is constantly in use in our kitchen. Gives you lovely, even heating for soups, stews, and roasts. On the pricey side but worth every penny. 10. Slate Cheese Board: Just picked up one of these for myself (happy early Christmas!) from Brooklyn Slate Co. Handmade and gorgeous, perfect for the entertainer in your life.